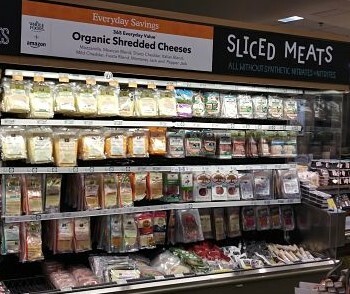 Is Amazon’s Whole Foods Market a Vegan’s Friend or Foe? When Amazon.com bought Whole Foods Market for $13.7 billion in 2017, some vegans assumed it would be a massive boost to veganism. It’s easy to see why: Self-described vegan CEO John Mackey remained in his position, and with such an enormous infusion of cash from Amazon’s winner-take-all Jeff Bezos, additional Whole Foods Market stores would expand public access to vegan food. More Whole Foods Market locations equal more vegans, right? Not necessarily. There’s a missing ingredient in Whole Foods’ recipe I’ll get to in a moment. 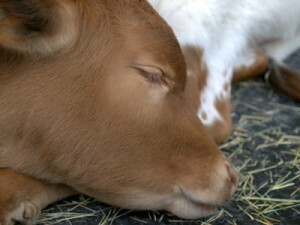 I occasionally shop at Whole Foods Market (“Whole Foods”) when I can’t get to my favorite Seattle grocer, Vegan Haven. Though there’s much to appreciate at Whole Foods, its allegiance to animal agriculture is visible everywhere. This is my attempt to understand how vegan food is presented to shoppers compared to other dietary practices and beliefs. I looked for this store’s vegan footprint on the customer experience. With thousands of products in each Whole Foods store, I had no practical way to inventory what was and was not vegan food accurately. The best I could do at the start was to compare the approximate length and height of coolers and freezers that prominently display meat, “dairy,” eggs, and fish to that of vegan products refrigerated and frozen along the walls. It wasn’t as easy doing this in the aisles away from the walls because the boxed, bottled, and canned foods were thoroughly mixed, vegan and nonvegan. I next considered the permanent signs Whole Foods uses to promote specific foods. Together, these high-visibility food displays, mixed content on aisle shelves, and prominent signs are what I took to represent what Whole Foods wants shoppers to see, feel, and understand about the dietary aspect of veganism among the many other beliefs focused on food choices. * And, of course, what it wants to sell the most. In the high-profile displays lining store walls, the lives and deaths of animals overwhelmed all else. 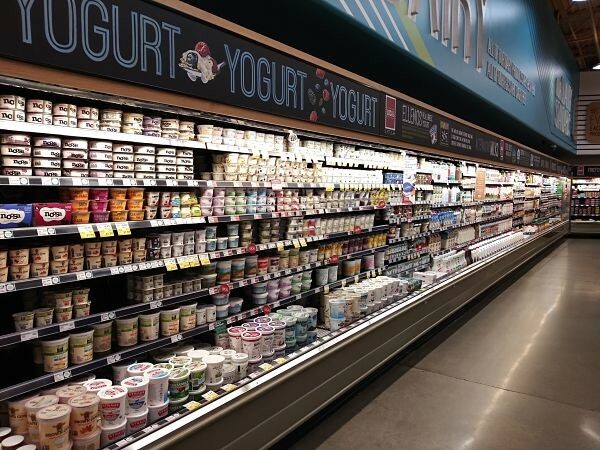 ** The food shelves and freezers along the aisles were difficult to quantify but are far more vegan-friendly, though diluted with “vegetarian” and similar animal-based products. Even with a considerable selection of vegan food in some areas, you will see no, or next to no signs that assure and excite shoppers about vegan food as it does for “animal products.” Whole Foods makes us work to read labels and look for third-party vegan certifications. The one exception I saw was a sign for vegan Beyond Meat products. From this exercise, two realizations followed. The first is that even if Whole Foods Market stocked two-thirds of the store with vegan foods, the remaining travesty and endorsement of nonvegan offerings would do just as much harm as it does at present. The second is that the informational content of the store is as important as the food. There’s a reason why Whole Foods Market appears to be financially addicted to omnivore demands for dead animals and the products they produced while temporarily alive. 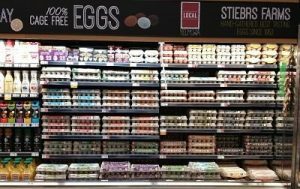 The addiction exists because Whole Foods Market has convinced its customers that the meat, fish, “dairy,” and eggs it sells are exempt from further moral and environmental considerations. When Whole Foods didn’t energetically invest in explaining and promoting the vegan diet and compare its benefits to products taken from animals, it ensured their customers’ demand for killing would continue. 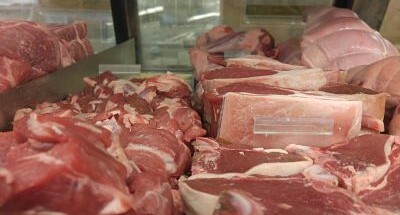 Over Whole Foods’ long, gleaming white cases filed with meat is the huge sign, “Butcher.” Other large signs declare that the remains of cows, pigs, chickens, lamb (who are less than one year old) and others are evaluated through a “5-Step Animal Welfare Grading” system. Whole Foods uses “the system” to persuade its customers that it objectively measures how “humane” a life and death those sentient beings had before being killed. This high-visibility approval reassures shoppers that it’s good to buy into violence and exploitation that leads to death. In reality, the “5-Step Animal Welfare Grading” system fails to grade itself; it can’t measure and account for the depraved injustices and violent attacks it approves against defenseless lives being snuffed and sold. It’s an empty and heartless gesture. Whole Foods messaging for animal-killing and exploitation is a direct refutation of the reasons for and values behind vegan foods. If there were an equal or greater promotion of vegan products, we’d see signs telling customers the truth that no animals were harmed and that ecological and resource impacts are a fraction of that coming from meat, “seafood,” “dairy,” and eggs. The absence of “vegan” signs is as anti-animal and anti-vegan as those that celebrate butchery. 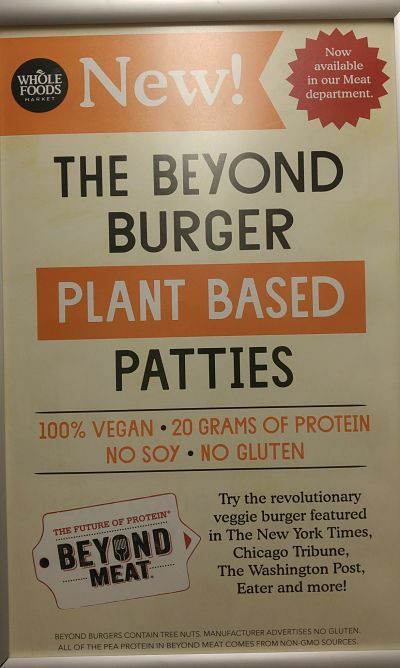 The emerging presence of one hundred percent plant-derived protein and similar vegan offerings will soon be available nearly everywhere in the U.S. within several years. Restaurants, “burger” drive-ins, and as we are already witnessing, mainstream grocery stores will expose more people to at least some categories of vegan foods than the 500 Amazon-fueled Whole Foods stores: Albertsons Companies (2,300+); Kroger Companies (2,460+); and Walmart (5,000+). 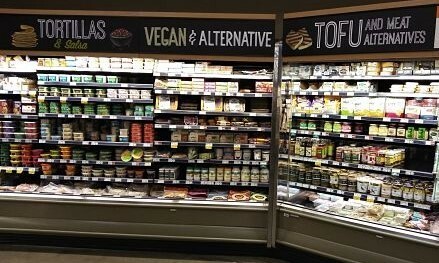 Those companies are not proactive advocates for vegans and veganism either, but the combined new availability of vegan foods coming to mainstream stores has the tipping-point potential for growing more vegans than Whole Foods, especially if it continues its current omnivore strategy. Costco already sells more organic food than anyone and is introducing vegan meals in its cafes, but otherwise, it is far behind the ethics of Whole Foods. Still lacking is an abundance of new, entirely vegan stores that will sell more than groceries. They will sell veganism. Whole Foods Market, again like mainstream food stores, takes no stance on whether killing and consuming animals for their “products” is wrong or even less desirable than how vegan food is sourced. If you had hoped or even dreamed that Whole Foods would eventually lead, educate, and support its customers in ending the inescapable abuse, violence, threats to health, and environmental impacts of animal agriculture, keep hoping but withhold your praise. It looks like Jeff Bezos doesn’t see or understand that vision as he is preparing to open a new grocery chain not based on the Whole Foods model. John Mackey, who recently wrote that a diet of ten percent meat was just fine because one could still stay healthy, has seemingly reached the end of his concerns, but I hope not. How Unique and for How Long? There is a lot to praise about Whole Foods Market including its LEED-certified buildings, a dedication to locally-sourced organic suppliers, supporting communities and causes, a wonderful if unaffordable for most selection of produce, and encouraging people to think, up to a point, about food. However, that’s not unique. 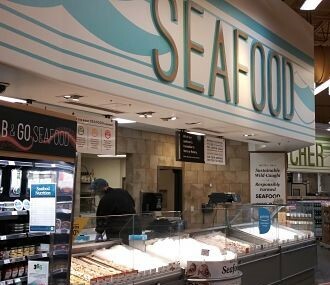 It is similar to stores like the Seattle area chain of PCC Community Markets (a co-op) that aggressively pushes meat, “dairy,” fish, and eggs with paltry vegan offerings. Both businesses teach people not to think about what humankind must actually do to stop the tragedies and disasters we ignite with the food in our mouths. For the moment, Whole Foods Market may be the only place vegan foods are available in some areas. However, that’s where it ends, as this commercial shows us. Perhaps Whole Foods Market may decide to stay where it is in the food industry niche, or with competition from mainstream stores, evolve its brand to nurture a demand for vegan food and the good it creates. As I experience it, Whole Foods Market sabotages the reasons anyone would consider vegan food (and veganism) by creating as much incentive, storytelling, and demand for killing animals as it can while offering a muted presentation of all things vegan. What’s the missing ingredient? An honest commitment to ecosystems and justice through nonviolence for all beings. It is important to understand the Whole Foods Market company recipe for what it is: “beef” stew with some carrots tossed in for color. Very good review. Thanks for all of the information. So disappointing that Whole Foods seems not to have an awareness of the positive role they could play on so many ethical levels, including climate change, by championing a vegan way forward. Agreed, Diane. Perhaps increasing vegan demand and competition will move Whole Foods to present the truth about “humaneness” and dietary environmental sustainability and all the rest. Until then, we are doig our part. Thank you, Suzanne. Please share the story and perhaps some day Whole Foods will chgange its ways. Why do vegans allow vegetarianism to define veganism? Will Anderson on Is Amazon’s Whole Foods Market a Vegan’s Friend or Foe? diane on Is Amazon’s Whole Foods Market a Vegan’s Friend or Foe? Suzanne on Is Amazon’s Whole Foods Market a Vegan’s Friend or Foe?